“Mustard Mushroom.” Say that ten times, fast. Let me begin with full disclosure: Martin ate these mushrooms begrudgingly, and did not like them. C’est la vie. Mushrooms seem to have some beneficial effects for ASD kids. (Again this year, Autism One has a seminar on the topic.) Unfortunately, Martin doesn’t like to eat mushrooms. My go-to method is mincing mushrooms and cooking them with lentils, which are GAPS-legal. 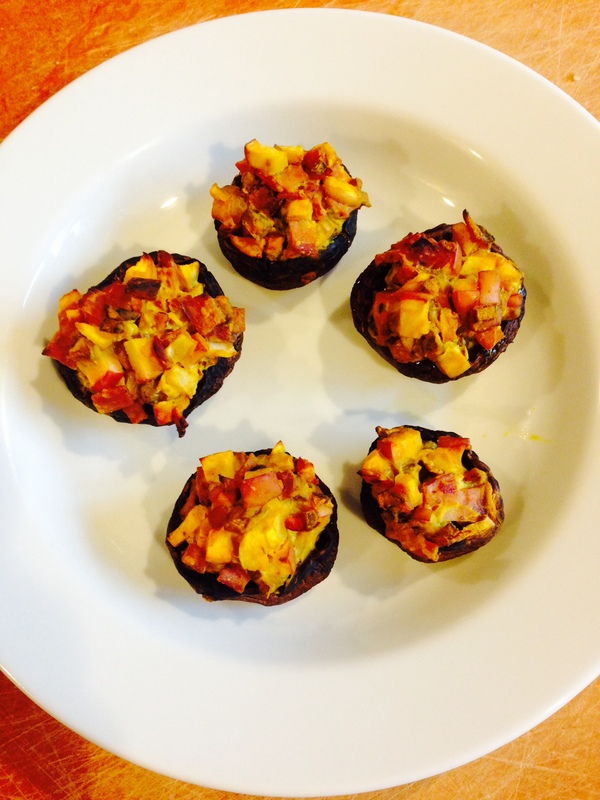 Also on the lookout for new ideas, I found a recipe on-line for stuffed mushrooms with mustard (his fave) and altered it to include the base ingredients I had. Dice the fruit, and the leftover meat. (I used turkey bacon.) Remove the mushroom stems from the caps, and dice the stems, too. I diced everything to about ¼-inch cubes. If I make this recipe again, I will dice smaller, which may make the “stuffing” more palatable. Sauté the mushroom stems in a bit of olive oil, and if the leftover meat isn’t already cooked, sauté that too. Mix the stems, fruit, meat, and mustard, and fill the crimini caps with that mixture. I also sprayed the caps with olive oil, to give them a sheen. Spray a baking sheet lightly with olive oil, and set the caps on that. Bake 15 minutes at 350 degrees. Some pictures are below. I’m thinking I could really use a “food stylist,” or at least a better camera. This is the way the mushroom boats looked when Martin’s meal started. Before long the boats became more of a casserole, as I cajoled Martin to eat what were clearly mushrooms. 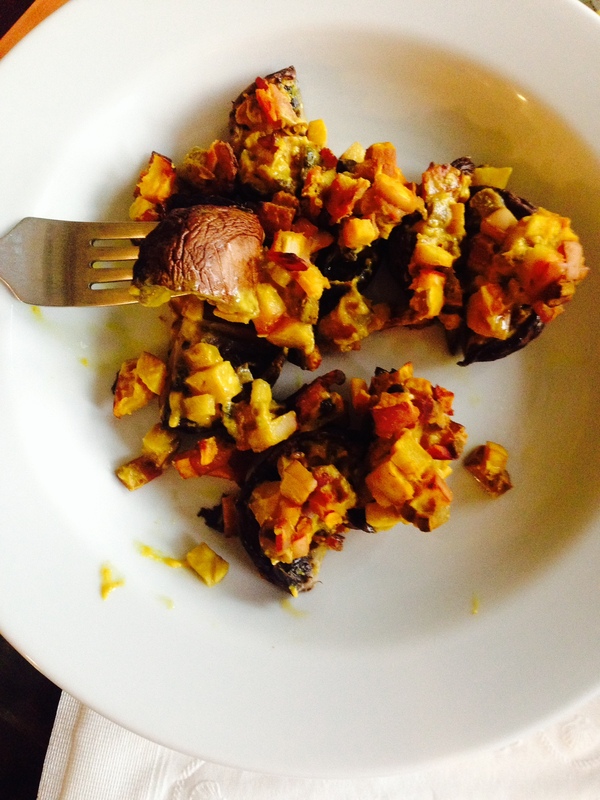 This entry was posted in Recipes and tagged ASD, autism, diet, mushrooms, mustard, recovery by findingmykid. Bookmark the permalink.